Established in the year 1998, at Noida (Uttar Pradesh, India), we, “Source India Shoes,” are engaged in manufacturing, exporting and trading a wide range of safety shoes, safety Masks, Reflective Safety Jackets, Safety Helmets, etc. These products are manufactured using the optimum quality raw material and sophisticated technology in order to meet the set international quality standards. Our offered product range is widely appreciated among our prestigious clients for their features such as comfortable fit, durability, skin friendly and longer service life. As per the diverse requirements of clients, these products can be availed by them in both standards as well as in customized options as per their varied specifications. We are supported with a well equipped infrastructural base that is divided into various functional departments, in order to carry out our entire business operations smoothly and in an organized manner. In addition to this, we have established a high-tech manufacturing unit, which is well-equipped with latest machinery and technologies that assist us to manufacture our assortment within a specific time period. These units are operated by our skilled team of professionals, who holds rich experience in the domain. To match with the latest developments in the market, we make necessary changes in our infrastructure in order to produce premium range of products. We are bestowed with a team of devoted professionals well-versed with the prevailing market trends and the requirements of our esteemed clients. In addition to this, our professionals work in a close-coordination and harmonized environment with one another to carry out their assigned responsibilities in a time bound and organized manner. Trader, Supplier and Outsource Manufacturer of Reflective Safety Jackets, Industrial Safety Shoes, Safety Goggles, Construction Safety Nets, Road Safety Products, Safety Harness Belts etc. we conduct strict quality checks to test the quality of each & every product delivered from our end. We strongly believe in customer (external & internal) delight, value creation & employee empowerment. Our core values lie in our vision & mission statement. We at Source India Shoes describe us as ‘an egalitarian’ & give an equal opportunity to all of our employees to move to higher responsibilities, take on new challenges & broaden their horizons to open up new success avenues. Customer is our greatest asset & is of paramount importance, we put them at the heart of our business. Our high-end infrastructural unit helps us in designing high quality products that comprises endless features and specs. We have divided our base into sub-categories, as it sprawls over a large area hence for the ease of operations we have imparted it into separate production base, quality control unit, testing wing, R&D wing, and designing labs. In addition to this, our spacious warehouse facility enables us to store bulk quantities of prepared products in an easy & safe manner. Owning to all these facilities we can easily meet with the urgent demands of our customers in a quick & fast manner. 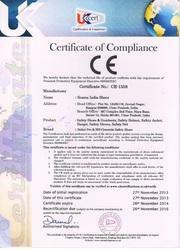 In the beginning stage of our business, we are only a small entity, but today we are amongst the leading brands of safety products. To live up this standard we make great efforts to work as per the desired needs of our clients based across the nation. All the latest technological tools & equipments are available at our procurement base. We are delivering excellent range of products that is only possible with the help of our skilled workers & designers. The reason behind our long run success is only and only our state-of-the-art procurement base that is laced with all the required machineries & tools.